Adriaen Frans Boudewijns (also Baudewyns; Bauduins; Boudewyns), Flemish painter, draughtsman and engraver. He was the son of Nicolas Boudewijns and Franoise Jonquin. On 5 October 1664 he married Louise de Ceul, and on 22 November 1665 he became a master in the Brussels Guild of St Luke, after having been registered as a pupil of Ignatius van der Stock (fl 1660) in the same year. By 1669 he had fled to Paris, where he met fellow Flemings, Pieter Boel, Abraham Genoels, Adam Frans van der Meulen and Jan van Hughtenburgh, and where he was mainly active as an engraver. He engraved van der Meulen s Battles of Louis XIV and numerous works by Genoels, van Hughtenburgh and by himself. These prints combine bold execution with careful attention to detail. In 1669-70 he was sent to the southern Netherlands with Genoels and van Hughtenburgh to draw three views of the chteau of Mariemont as tapestry designs for the Gobelins. In the Gobelins accounts there is evidence that the three artists were also paid for a series of tapestry designs depicting the Months of the Year. On 12 January 1670 his second marriage took place, to Barbara van der Meulen, Frans s sister. After her death in 1674, he left Paris and returned to Brussels, where he is first mentioned in 1677. In 1682 he accepted Andries Meulebeeck and Mattijs Schoevaerdts as pupils, and in 1694 his cousin Adriaen Boudewijns (b 1673) was apprenticed to him. 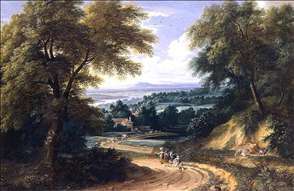 See more details about "Landscape with Travellers"